This week, on Small Moments Mondays, I am thrilled to share with you my friend Roxane, from Days. She’s tough. She’s strong and sassy. She’s not to be messed with. Want proof? Read Quarantine Tales. She’s funny and open. Go read Men Don’t Have to Sit … you’ll see exactly what I mean! She’s an amazing storyteller. Go check out A Fish Boned My Mom & Other Tales. Seriously, this girl can tell a tale! Thank you, Roxane. Thank you for allowing me to post your story here on Small Moments Mondays. I am honored to be able to share your words. I am truly in love with this piece … it makes me all soft inside. Much love to you! I wrote this post when we got home from the movie that night and put the boys in bed. I guess this is something like a thought map. I wrote out the thoughts and feelings, as fleeting as they may have been, as accurately as I could remember them. I am so very glad I did. I remember once that you told me you did not have the ability to stop and really savor a moment. You are a big fat liar. This is awesome and poetic and gorgeous and heart-rending. And I love you, sassy one. There are no drive-in theaters around here any longer. I remember the giant feeling of the sky and the monumental screens. We didn't buy concessions, we brought stuff with. And we went in jammies, with blankets and pillows. What a lovely memory to give me tonight. You captured a moment in time perfectly. I grew up in a town with a drive in and my parents were big movie goers, so in the summertime that was our weekly activity. And like Lori I went in my PJs. It was always a double feature and I always fell asleep in the back of the station wagon during the second movie, woke up being carried out of the car by my Dad. Happy memories, thanks. My kids have never experienced a drive in, and the way they fight in the car, um no thanks. Big sigh again. Love the sweetness of this post. Poetic, real, loving. From the big screen to the small boys, via handmade quilts, popcorn and sticky boys, just beautiful. As in all things, you come at us straight from your heart. And you make me want to go to the drive-in. The drive-ins here died out years ago. I miss them. My parents would pack 5 of us up in the station wagon. With pillows and blankets. I miss that. They were gone before my daughter was born. And now there’s not the opportunity with the grandkids either. Yes, make it a tradition. Your boys will remember it forever. Very well written and extremely heart felt. My heart felt it and I wasn't even there. I think I may go, though, with my son. It was a riot to see his reaction to a big screen and surround sound at the theater, but I bet in the comfort of our own space, we could enjoy it the way you did. You grabbed that moment and blew it right up, girl. Oh, Roxanne. This is what I picture "In These Small Moments" to be all about. How absolutely beautiful. Like Lori and others, my folks loaded my brother and 2 sisters up in our station wagon in our pjs to go to the Drive In up in Norfolk, NE. We brought our own stuff but – I remember walking through the gravel to get to the very dirty bathrooms and thinking how glamorous the teenage girls looked in there touching up their makeup and fluffing their hair. We do make memories so easily for our kids – and they don't require the BIG BANG of expensive or lengthy trips or items. They just require us and our savoring of the moments. Like you did right here. Much love – sorry for the novel. This WAS that day I said that to you. You inspired the "thought map" or whatever it was. You also inspired the looking more closely. What I found was incredible. I actually have an egg crate that *stays* in the back of my car. We then cover it with a blanket and take about 5 pillows to get all cuddly. I'm glad you liked it. Really glad. I'm happy it brought back a sweet memory for you. The beauty of the drive in is it turns them into different kids. Like angels. They get all glued to the screen and have very little to fight about (unless one of them snags the other one's pillow or something). At least this is what happened in my experience. If you have a drive in close, you should DEFINITELY take the small boy. He would LOVE. Thank you, lovely lady. That means a lot coming from you. Really. It's funny. This particular drive-in just started up about 5 years ago. It's amazing how big of a response they got, too. On Fridays and Saturdays you have to get there 1-2 hours ahead of time just to get through the line of cars that backs up along one of the highways. It's craziness. Maybe one of these days, someone will put one up in your area. YES! Being in a comfortable space and not cramped up between a bunch of hormonal teenagers is a big perk. It's also nice that you don't have to "shush" them every five seconds. So so lovely. I'm so glad you liked it. Thank you. Always glad to give people the happies! My oldest is about to be 5. It's ripping my heart out, but it's also wonderful to see him become an individual. He is becoming such an awesome miniature person. Still, soak up every second you can while E is still little. You WILL miss it. Never be sorry for the novels you write me. I love them! It's just like how kids usually want to play with the cardboard box the big ticket item came in rather than the big ticket item. I find they like to keep it simple just as much as we *try* to. The simple, easy times are the ones I have remembered, so I hope it carries over to them. I meant to tell you sooner! But you know, mom-brain or whatever. That was the day you wrote about the hammock. It stuck with me. Big time. Thank you, Cheryl. Sweet it was. Hi Roxane, just wanted to stop by and say "hi." I saw you on Babble's list so I decided to come and check out your blog. It is incredibly sweet and thoughtful. And you meant Nichole on the Babble part, surely. She really truly deserves it. So much. So, I'm notoriously not a big commentor on my wife's blog, but I loved your post today. It sounds like a beautiful moment and one you can repeat moving forward. But candidly…what struck me? Is how polarizingly opposite it was from my memories as a kid of the drive-in movies. Being shoved down on the floorboard so as to not pay the extra $2 or $3 dollars for a child? No…I actually remember my parents taking us to see Stephen King's "Salem's Lot" – lovely. I remember my older brother in the car, screaming in fear and begging for us to leave. Me? I was too young, so I wasn't really scared. But…I do remember laughing at my brother and so therefore? Not a bad memory, I guess. Enjoy those small moments. Thanks for sharing….just beautiful. I love that I have pulled you into the comment section. Yay me! Thank you. You will be glad to know they have eradicated the need for children shoving by letting them in free. Well, up to 5yrs anyway. That is just awful. 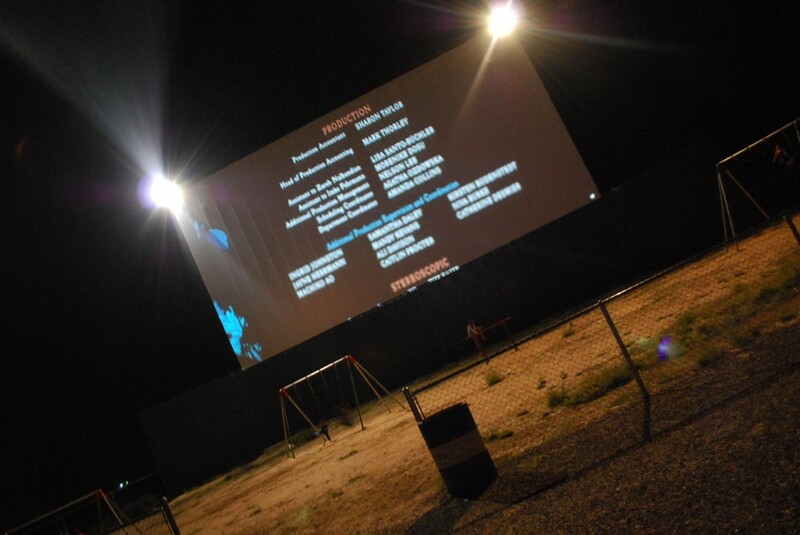 Maybe you can make some *new* drive-in memories with your beautiful babies. Salem's Lot? Really? Sheesh. I'm still not brave enough to watch it at 26. That's messed up. At least you got to laugh at your brothers misfortune, I guess. What are siblings for? So sweet. I love the images you painted with your words. You SO should if you have the chance.